Four of Amy Williams’ top five scorers this season are underclassmen. Three of them are freshmen. All three of them come off the bench. It’s been a weird year. The Husker women’s basketball team has struggled to maintain last season’s success. 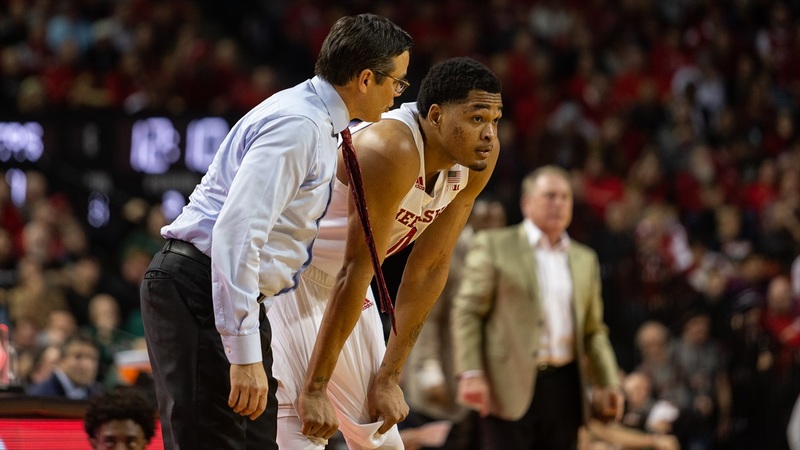 It was somewhat expected, given the losses of key guards Jasmine Cincore and Janay Morton and the makeup of the roster (45 percent of the locker room is new players), but maybe not to the extent the Huskers have actually struggled. Starting 2-5 after a breakout 21-11 campaign is a little jarring regardless of circumstance. The starting lineup through the first 16 games (a 7-9 record) was reliant on the upperclassmen and the women that have been a part of Williams’ program for long enough to know what she wants. Junior point guard Hannah Whitish, junior two-guard Nicea Eliely and senior forward Maddie Simon looked like stalwarts in the starting five regardless of performance. You can probably factor sophomore center Kate Cain into that group too just based on the minutes she has already logged as a second-year player. Freshman guard Sam Haiby is currently averaging more points, more rebounds and fewer turnovers than Whitish while out-shooting her 44 percent to 32 percent. Whitish has Haiby in assists but the offensive rhythm is noticeably different when Haiby is on the floor, in a good way. Haiby is the team’s second-leading scorer at 10 a night. The leading scorer is freshman wing Leigha Brown, another bench producer. Brown excels offensively while Eliely is more of a defensive-minded guard. The decision to go with Eliely in the first unit is more of stylistic preference for Williams. Ashtyn Veerbeek — fresh off a career-high 19-point, eight-board performance against Illinois — is outscoring Cain and nearly matching her rebounding. Cain gives rim protection on defense, Veerbeek gives floor-spacing on offense. I’m not ready to say Veerbeek is the better of the two, or say that about any of the freshmen for that matter, but that we’re even having that discussion is somewhat surprising. If she wanted to, Williams could tweak her starting lineup to get the best players on the floor earlier while ultimately still playing the same kinds of rotations. But it’s not really about the starters, it’s about who’s playing with who and who closes out halves. The freshmen on the whole play less than the upperclassmen. Maybe that needs to change. The positive here is Williams hadn’t looked to make that kind of change to the first five up until Thursday night when she swapped Simon — the Husker who has been here the longest — for freshman forward Kayla Mershon. Mershon wasn’t great (five points, four fouls, two turnovers) but she plays hard on defense and Nebraska actually opened a game hot for a change. The Huskers jumped out to a 15-2 lead and that fueled a 10-point road win. Incredibly small sample, yes, but the end result at least makes tinkering worth exploring some more. Nebraska needs to turn its season around; getting funky with her lineups is a good sign Williams is trying. Okay so we had good basketball, now here’s bad basketball. The problem is you know the ability to hit shots is in there. This isn’t a case of Palmer just not being able to make 3s. You don’t shoot near-70 percent from distance over a four-game stretch if you simply can’t make them. The problem is shot selection and mechanics. Still from FS1’s Thursday night broadcast of No. 6 Michigan State vs. Nebraska from Lincoln, Nebraska. Look at the time, look at the score and look at the shot clock. This came off a Thomas Allen Jr. steal while Michigan State was looking to attack off a missed Nebraska shot. So, two Spartans had already leaked out looking to run in transition. Nebraska has a four-on-three here. Tanner Borchardt clogs things a little with where he’s at but Glynn Watson Jr. and Allen have spaced well enough. Look at the lane. Palmer has an easy path to the bucket. He’s either getting a layup or he’s putting a foul on center Nick Ward (good) or point guard Cassius Winston helping over (really good). Instead, he pulls up from 3 and bricks it. Palmer was 1-for-6 shooting at that point. Here we get a look at both shot selection and mechanics. I asked head coach Tim Miles Wednesday about Palmer’s shooting of late and he said the balance is all off; Palmer has been landing too frequently on one foot. Watch his feet in the clip above. One foot again. But in this case he had to fade a little because he’s not even close to being open. Michigan State defender Matt McQuaid is right in his grill to contest. And Palmer fires anyway. At that point Watson had initiated a play for Roby at the top, Palmer doesn’t curl off Roby enough to catch his guy on the screen (freeing McQuiad to contest in the first place) and pulls up with 17 seconds still on the shot clock. Nebraska had just taken the lead before this possession. Palmer was 1-for-9 at that point. After barely catching iron, Michigan State pushed in transition and Winston banked in a triple to retake the lead. Nebraska trailed the rest of the way. This one isn’t a 3 but it’s still a horrible shot. An off-balance pull-up jumper from a foot inside the 3-point line with 28 seconds left on the shot clock? No. All kinds of no. Maybe all the settling was because of this. Nebraska has four guys near the paint just standing around ball watching, so there’s absolutely no room to work with, but Isaac Copeland and Allen almost look like they’re waiting for an action that never comes. Palmer takes a Roby screen and spins into two guys for a tough floater. Nebraska had issues getting the ball inside and finishing over Michigan State’s length for most of the evening. Palmer got blocked a few times early on drives inside and maybe that forced him to change his approach. Nebraska has to find better ways to get Palmer easy scoring opportunities going forward, but Palmer needs to be much more selective with the jumpers he takes. None of these are high-percentage looks. Nebraska announced Fan Fest Friday morning, with a date for the free event set for Friday, Feb. 1 from 6 to 8 p.m. at the Hawks Championship Center. Nebraska looked promising at times last season before a stretch from March 25 through April 24 in which it lost 12 of its 16 games. A 24-28 closing record had some speculating about coach Darin Erstad’s future with the program, but I think there should be reason for optimism this season. Nebraska brought in four transfers to the program (one with Division I pitching experience) and signed a top-25 recruiting class, according to D1Baseball.com, that was also pegged as the best in the Big Ten. The Huskers open the 2019 regular season with a weekend series against UC Riverside in California, starting on Friday, Feb. 15. I have no idea how Watson did this. It’s obviously not as crazy as I’m making it out to be but the degree of difficulty to do that while laying on your stomach and getting the ball without getting the offensive player’s hand? And Watson has been really impressive on the defensive side of the floor this season. He’s averaging nearly a steal-and-a-half a night and has far and away the best defensive rating of his career. Per 100 possessions, Watson is giving up 91.7 points. For context, in his previous three seasons he’s never been below 102. Among qualified players, he’s got the third-best defensive rating on the team and the 16th-best mark in the conference. He's also nearly set a career-high for defensive win shares, a counting stat, with half the season left to go. His career-high is 1.5 in 32 games last season; in 18 this year he's already at 1.4. A lot of times defense is about hustle plays and effort. Watson still getting after it while laying on the court checks both those boxes. I'm stretching a little here given this happened last Saturday night but if I'm limited to the last week and that clock starts when this gets published, a previous Saturday counts. Plus, what quarterback Adrian Martinez said when he made an appearance on Sports Nightly is just too great not to give some more love to it. “Technically this week is optional but guys on the team made sure to let everyone know we're getting to work right away,” Martinez said. “We know what we want to accomplish and that's going to take some hard work and dedication throughout this semester, throughout the fall, throughout the season. It starts now. “Guys have to give it their all in the weight room. You have to get done what you can day-by-day. We have to get better. We have to push ourselves, push each other and grow as a team. I think some of these new guys coming in, we have to pick them up with us and get them on the same standard." Even as a true sophomore, Martinez seems poised to be a vocal and emotional leader for Nebraska next season. He's what you want in a quarterback. That the team as a whole looked at optional offseason workouts and said, "Nah, everyone needs to be here," is encouraging. There was so much talk about culture last season I don't really want to get into all that again, but this is what Scott Frost wants in his locker room. He wants a team that polices itself and takes control of its own destiny. You know a good culture when you see it (or in this case hear it) and Nebraska's seems stronger than it has in some time. The Huskers have plenty of work to do in order to reach what is looking like a higher-than-expected ceiling in Year 2 under Frost, but early talk out of an angry and focused team in winter conditioning is about as encouraging as you can hope for.